Trying to decipher kata (solo practice forms, usually of Chinese origin in karate styles) is akin to interpreting the Bible, and often can get you in as much trouble. Bunkai officially translates as kata's application, although explanation is probably a better word. In kumite, fighting full bore all the time has its obvious drawbacks. Employing true martial waza during sparring is definitely not socially responsible behavior. So to maintain the original fire that a traditional art was forged in, we have kata. Kata, specifically bunkai, reminds us that the martial arts are of a very serious nature. When Okinawans were denied the right to bear arms at various times throughout their violent history (including the US military occupation following the second World War), the practice of kata became a stealthy option. Karate's earliest training sessions were shrouded in secrecy, and often took place after dark. So it should come as no surprise that kata was created, in part, to conceal its real purpose. Attack/defense scenarios are presented in the kata one after another. Since the human brain is hard wired to retain information more efficiently by rote (like the telling of an old story, or learning a dance sequence), kata makes a superb training tool. Although it's rarely done, the bunkai should be revealed along side the teaching of the kata right away, for clarity's sake. Many of these ancient forms are so old, their meaning has been lost. Traditional practitioners should be aware that kata is not universally accepted in combative systems. Muay Thai kickboxing, for example, which has a history that actually pre-dates Okinawan karate, does not include forms in its teachings. The relevance or need for kata is largely questioned in martial arts circles, and remains as one of the more controversial topics of discussion amongst practitioners today. Being one that originally did not believe in kata or poomse, I believe it now after understanding and witnessing it's application. I admire those who practice their forms daily. Your mention of kata in secrecy is very correct along with other systems that were 'banned from public display' right after WWII, e.g. Aikido. Krav Marga and other style don't incorporate forms. If visualization is truly training, then kata is training. A healthy debate. My opinion? A real fight, with biting, clawing, headbutts, name it happens to us very seldomly. And most that do defend a side of this argument will never be / have never been in such a situation. Something that lasts about 15 seconds, btw. Training for that 15 seconds can take a lifetime. I believe it has do to with if you're an auditive or visual type of person. I say train in all stuff. Specializing in something could lead to a "weaker" training. But still, it's better than nothing. I've got enough battles to wage inside my head. I leave those debates to other thinkers. If they have time and enough clarity of mind to do so. Ego has a major role these days. "Trying to decipher kata is akin to interpreting the Bible, and often can get you in as much trouble." You have such a wonderful writing style.. you can capture so much truth in so little words! It is so true that the movements in kata would not be too fun to experience in reality as a recipient.. broken arms, torn off testicles.. yeesh.. shudder.. ugh... and therefore, I have to agree with those who say that the kata cannot help one become a "better" point system tournament fighter. Aikido of all things. Ironically, Aikido is the only martial art that's allowed to be taught in the US federal penitentiary system. Actually, 15 seconds is lengthy for a "real fight". Most street fights are over with one shot! That's why I have to laugh whenever I get to watch the John Wayne classic, The Quiet Man. It features the longest fight scene in cinematic history (30 something minutes). It may surprise you to know that my experience is that people who perform well in kata, also excel in kumite. Strictly speaking of course, kata and point fighting are distantly related topics. I was taught that the form is the heart and soul of Kung Fu. Don't get me wrong, I love sparring, but for me the forms are what puts the art into this Martial training. Otherwise for me, it's just a fight. The forms are where you really confront yourself and your fears - and you have to overcome all of those before you can fight anyone else and win. Ultimately, the person you are fighting in the forms is yourself. OK, I admit that's a bit existential, but isn't that what training's about? As you say, John, it's an end in itself and a means to an end. 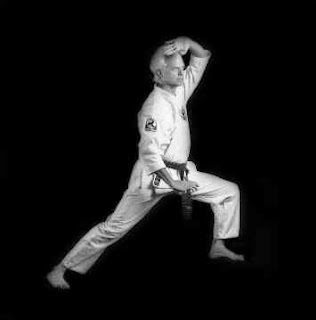 Kata (forms) practice is the best training of all because you can do it at any age. Recovery times related to sparring injuries will grow with time, and that's true of everyone. This is true even for the best fighters. It's funny you mention "confront yourself" regarding forms; whether I was testing for rank, or competing, I always found performing kata more challenging than sparring. Wow! Karate without kata? I can't even imagine. So much of my karate training is focused on kata and waza, and our martial arts is Okinawan Kenpo. I can't imagine a better way to learn fighting techniques. I can't imagine what we'd do in class without kata. Hmmm, food for thought, for sure. Some schools emphasize kata training more than others. You have to admit though, it does take up a sizable amount of class time, which is probably a good thing. Anything's better than knuckle-pushups! Forms, poomse, etc. have a place in traditional Japanese, Chinese, and Korean martial arts. The comparison between martial arts "should" be based on the goals, teaching methods, and the techniques of different fighting systems. Such comparisons tend to be controversial when there is a lack of context. This in turn makes an objective comparison impossible. Sure professional fighters or those in law enforcement or the military become great fighters without forms. But again it's the context: A karate stylist would not practice speed bag drills to prepare for tourney that included forms competition. This is another one of those topics that I need to write about myself. I too used to think that forms were pointless until I had a teacher put them in their proper context. (ii) because the moves are pre-arranged, training intensity approaches kata level with little risk to your partner. (iii) application of the technique is incorporated directly into the training. The disadvantage, of course, is that this method of training can't be used for eye gouges and testicle grabs and other such attacks on soft tissue. But for learning how to string basic techniques together into combinations while maintaining a tight defense, nothing beats it. Forms of any kind focus on multiple assailants. Fighting, as we define it, deals with a single opponent. I believe that's the basic difference. If you think about it, there's some semblance of forms in the areas you mentioned: Pro-fighters (e.g. boxers) have shadow boxing. Law enforcement/military utilize some self-defense strategies which could have been inspired from forms' applications. I know it's a bit of a stretch, but I'm sure you see what I mean. Welcome to my site. I must say, this is the first time a savateur has commented here. My limited understanding of savate is that, like most of the Asian martial arts, it's been mellowed through the years. Quite possibly, much of the original teachings that may have included a vast array of self-defense techniques are no longer taught, or have been lost. Thanks for your input. I've always thought of the term "bunkai" as a misnomer. In the "old days" bunkai referred to analysis of the movement; that is, it referred to the exacting specifics of how you executed a movement. Bunkai included things like keeping your shoulder and elbows down, the proper moment to drop your weight behind a punch, etc. The application of the movement in a fight was referred to as the "meaning" or "imi." I wrote a long-winded essay on remembering the distinction between the two about a year ago, but my argument boils down to that if you don't understand the proper science (i.e., biomechanics) of how you move - the "bunkai", then the meaning - the "imi" - of the movement is worthless since it is something you cannot effectively apply. I've seen bunkai that would make you laugh; "creative application" is an understatement (I'm sure you've seen some of this yourself). Your point concerning proper movement and body mechanics is well taken.